Cannoli's are a dessert favorite in our home. We don't have them often, so when we do it's definitely a special treat! 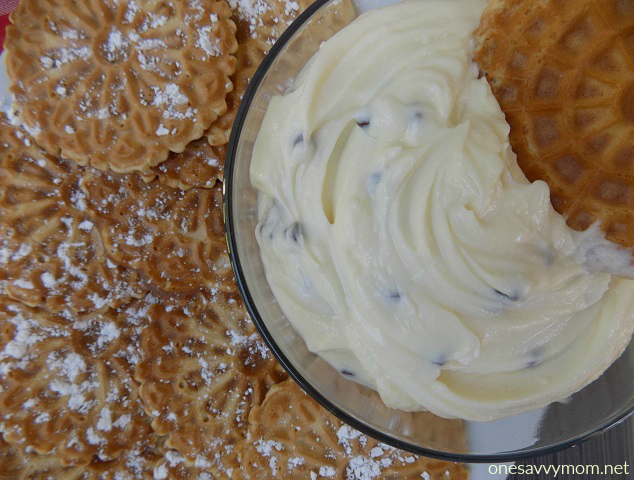 I've made Cannoli's a few times in recent years from scratch, and this past weekend I tried my hand at a simple twist on this family favorite; Cannoli Dip. This recipe for Cannoli Dip incorporates all of the flavors of a traditional Cannoli, into an easy to prepare dip. I served it with anise Pizzelle cookies, and it was absolutely delicious - definitely a crowd pleaser! 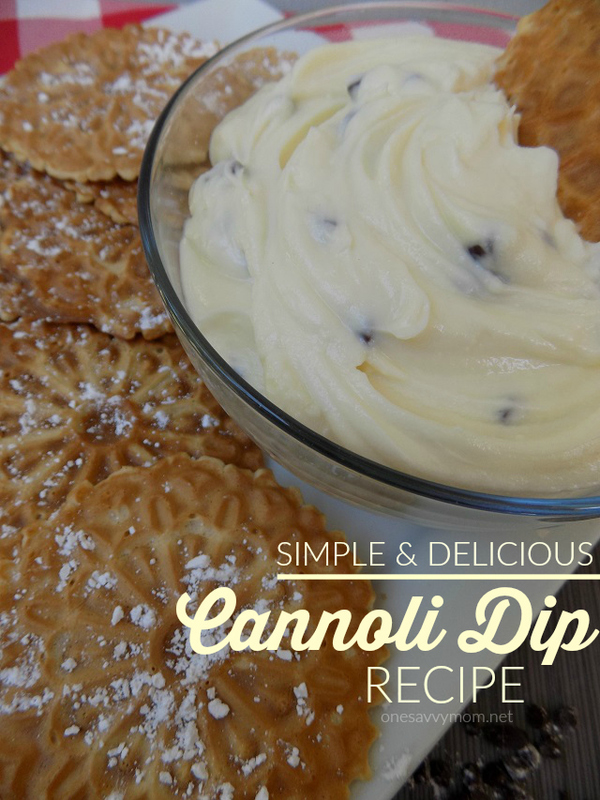 Grab my simple and delicious recipe for Cannoli Dip, below. Refrigerate time: refrigerate for a minimum of 10 minutes prior to serving. Pizzelle Cookies (typically available in anise and vanilla flavor choices in most bakery sections at the grocery store ). OR you can try your hand at making them from scratch. Combine ricotta cheese, cream cheese, confectioners sugar and vanilla extract in a large mixing bowl. Use a hand mixer or mixer set at medium speed for 1-2 minutes / until your mixture is smooth. You can also whip the mixture by hand using a whisk if you don't have a mixer available. Next fold your mini semisweet chocolate chips into the mixture by hand until evenly distributed. Cover tightly with a lid or wrap and place your dip in the refrigerator for a minimum of 10 minutes to chill, prior to serving. 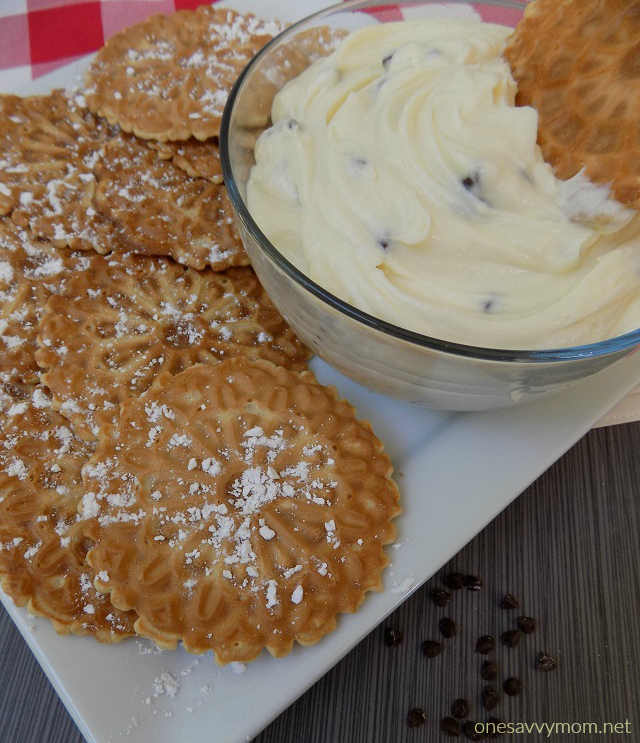 Serve your Cannoli Dip with Pizzelle cookies (optional: dust your Pizzelle cookies lightly with confectioners sugar prior to serving). You can store any left over dip in an airtight container for up to 3 days.